Blondie and Dagwood Bumstead of "the small house in Shady Lane Avenue" leap from the pages of the famous comic strip and in to this high-spirited radio series. In any given episode, commotion is sure to be caused by the impulsive Dagwood. Although he is a math wiz, he has no common sense whatsoever. 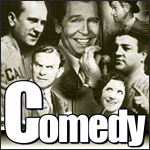 The radio program followed the story lines of the comic strip. When the Bumstead family grew in the funnypapers, it grew on the air. First came their son Alexander, and then came their daughter Cookie. Several actresses played the title role: Penny Singleton, Ann rutherford, Alice White and Patricia Van Cleve. Aurthur Lake played husband Dagwood Bumstead.